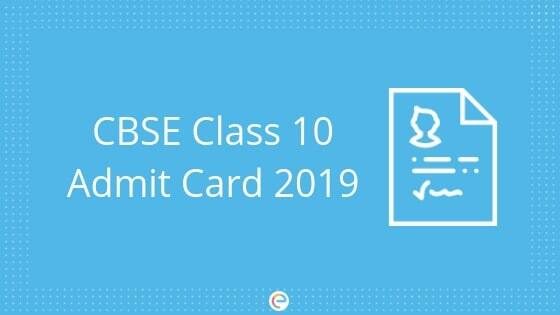 CBSE Class 10 Admit Card 2019: The class 10th is important for a student’s career. Hence it is important that a student put all his/her effort in preparation for the Board exam. CBSE Class 10 Admit Card for private and regular students is available now. And the board exams for the students of class 10 will commence from March 2019. Those of you who have to write the Class 10 Board Exam should download their CBSE Class 10 Admit Card from the CBSE official website at the earliest and avail the guidance. Last time, 16,38,428 students had appeared for Class 10 board examination. This implies the level of competition that this year’s aspirants will face. With the increasing complexity in the nature of examination over the years, it is advised to be fully prepared for even the most challenging paper. Also, it is our humble request to the students to not panic over the high competitiveness of the examination but to use it to your advantage. All you need to do is strategize, focus, finish your syllabus and revise it well in time. We wish all the aspirants for this year our very best. More details regarding CBSE Class 10 Admit Card are given below. Last year CBSE decided to implement the overall 33% pass mark criteria. How to Download CBSE Class 10 Admit Card? Select on the region which you belong to. Click on one of the three options available – ‘Application Number’ or ‘Previous Roll no. and year’ or ‘Candidates Name’. Now enter the details required which will be as your choice made in the previous step. Take a print of CBSE Board 10th Roll No Hall Ticket pdf file to attend the 10th class Public Exams. Every year, CBSE 10th Admit card released before one month of the examination. It is expected that the Board will soon announce the CBSE Class 10 Admit Card 2019 on the official website of CBSE before the examination. Students must keep in mind that CBSE Admit Card is very important for all candidates who will be writing the CBSE board examination. Candidates failing to produce proper Admit Card will not be allowed to enter into the examination hall. Exam Centre Locator is a unique Mobile App developed for the Student of CBSE. This app helps students to quickly know the exam center on the basis of Roll Number. The student can easily find the address of exam center, images of exam center, geolocation of center on the map and know how to reach. A student or a parent has to register through the mobile number to receive an OTP (One-time password) number. The OTP will help log on to the Centre Locator App. The student or parent can then access information by selecting the option X and entering the Roll Number. The student’s information, address and photograph of the exam centre will be displayed on the screen for easy identification by the students. How to reach – this feature enables students to fetch the route map from their current location to the Exam center location, thus, enabling a quick assessment of the time needed to reach the center. These are the details that will be mentioned on your CBSE Class 10 Admit Card. 18 Instructions to the Student, etc. You can take mock tests at embibe to see your performance. It’s not necessary to finish the entire syllabus for taking the mock tests. You can take practice tests right now which are based on each chapter and concepts according to class 10th syllabus. We hope that this detailed article on CBSE Class 10 Admit Card helps you. If you face any issues concerning the CBSE Class 10 Admit Card or any aspect of the exam in general, drop your query in the comment section below. We will get back to you at the earliest. Want to score better in your CBSE exams? Learn all the concepts in an interactive way from the best CBSE books for FREE! My daughter is in Class X. Still we do not know Computer exams will be there as 6th subject? information and communication technology for class X will be conducted in school or in the exam centre? It will be held at the exam centre. which will be the user ID & Password for locating Admit Card for class X ? User ID & password will have been provided by the board during application. Kindly check with your school authorities if you’re not sure. User ID & password will have been provided by the board during application. Check with your school authorities if you’re not sure. Patel, please contact CBSE Board- CBSE Helpline Number or Better visit regional CBSE office to get the correction if you live in a nearby city. I am in 10 th class and I recently got to know that the photograph on my admit card in blurry. Now what should I do?? Please help me. The examiner will match your signature with the printed one. Please check with your school. Lavanya, please contact the school for this matter. Arjun, please contact the school authorities. Arjun, you need to contact your school authorities, they can help you regarding this. Please contact your school or CBSE officials. Which admit card are you referring to? hey Saurabh, if you are a private candidate then click on this link https://cbseonline.ernet.in/pvtform/pvtAdmCard.aspx and download your admit card. If you’re a regular student, then your Roll number will be provided by your school officials. in my daughters admit card the date of birth is incorrect. what can i do? she is a regular candidate. Hey Bijaya, Kindly contact school officials for this matter. Hey Harsh, what is it saying exactly? Hi Abdul, Once you have paid the CBSE exam fee, you have the right to appear for the examination. Hey Rohan, No you must carry only original CBSE Class 10 Admit Card to the exam hall. The link for 2018 CBSE Admit card is deactivated. So there are less number of chances to download your CBSE Class 10 Admit Card.